"...Copenhagen deal in unusually subtle orchestral pop, and their Sweet Dreams... is the stuff of deliciously penumbral slumbers." "Sweet Dreams... paints singer Neil Henderson as a man for whom melancholy is a way of life." "Il est impossible de ressortir indemne d'un tel voyage initiatique." "...this collection of songs from Kirsa Wilkenschildt and Neil Henderson sneaks into your life, and mingles with your subconscious until the point where you cannot live or function without your daily fix." 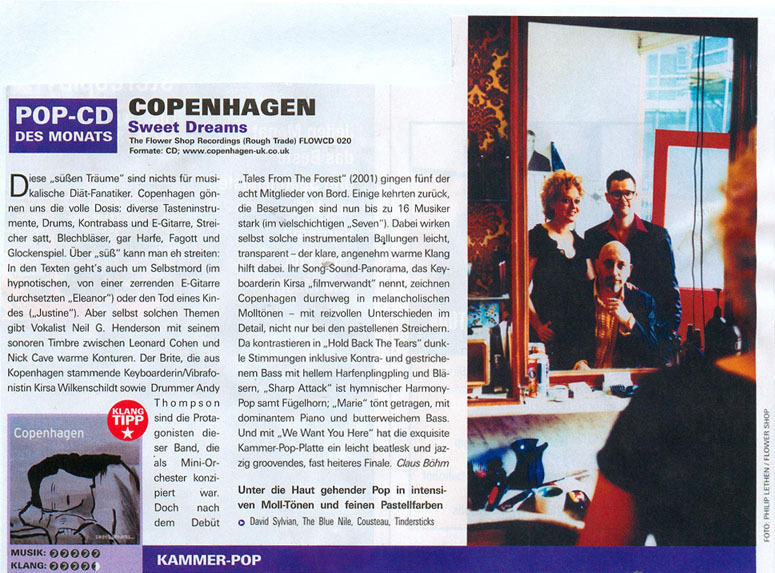 "Copenhagen (who hail from London rather than Copenhagen) are of the Tindersticks school of crepuscular pop. Their debut album often seems as substantial as a wisp of smoke - a virtue in this context. So introverted are lugubrious singer Neil G Henderson and his seven colleagues that they appear to have been in separate rooms while recording their parts. But then, it would have taken considerable resilience to have been around Henderson during his contributions, because when in character he is an unnerving presence. Murmuring "Another battered bride hopes he doesn't hit the child" on Happy Ever After, he sounds as if he is teetering on the edge. Five-Year Diary, a glockenspiel-embellished tribute to diary-keeping, ends with the narrator's suicide, which sets us up nicely for the rest of the album. Violets is a dissonant duel between Henderson and backing singers Pauline and Jacqui Cuff, while Poison Kiss is a quiet nightmare of violin and ghostly whispers. Great stuff." "Surreal, dark, melancholy show tunes. Genuine eccentrics in an age of conformity, Copenhagen (from London) feature an eight-foot-six frontman in Neil Henderson, effervescent twins Jacqui and Pauline Cuff and around nine million instruments, including plaintive violins from sometime Jack bow-person Ruth Gottlieb. Their dark, theatrical cabaret could be placed between Tindersticks and Cousteau, but these jazz-tinged stories of love, betrayal and nightmares are above all individual. Something is wonderful in their state of mind, if not Denmark." "After two excellent EPs, Copenhagen makes the leap to a full-length album with smoky, dramatic Tales From the Forest, laden with all the late-night jazz-touched moodiness anyone could want,..."
"There will always be a need for bands who are not afraid of challenging traditional limits and, when at the same time, it is done so elegantly and masterfully as is the case here, who can ask for more! Copenhagen is a definition of style and Tales of the Forest is tangible proof of this. Every time you listen to it, new details are experienced and there is no doubt that this is a record that you never grow tired of listening to and one which you are never quite finished with. My candidate for the year's best album!" Plucked strings, noir-keyboards and spy-thriller themes abound, and the song weaves a wicked romantic spell. "Copenhagen are both unorthodox and unique. With songs as strong and as versatile as the ones displayed on this EP, it seems that Copenhagen are going to be the most exciting new musical acts of the year."